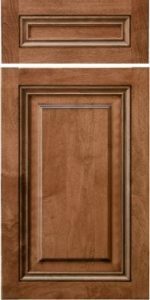 The Presidential Square door is a stunning design that has graced many award-winning kitchens. To maintain this door design, but at a reduced cost, consider using the Mitered version of this door. The joinery change from Mortise and Tenon to Mitered can save hundreds of dollars on the average kitchen project. All available. All incur special lite charges.